Kingston Satin Nickel Shower Diverter button for use with Clawfoot tub Faucet: This Hand Shower Diverter Button is built to last. The highest quality standards are used to precision manufacturer a top of the line fixture. Important features of this 100% BRAND NEW Fixture: Complete Item! Everything necessary for installation is included. 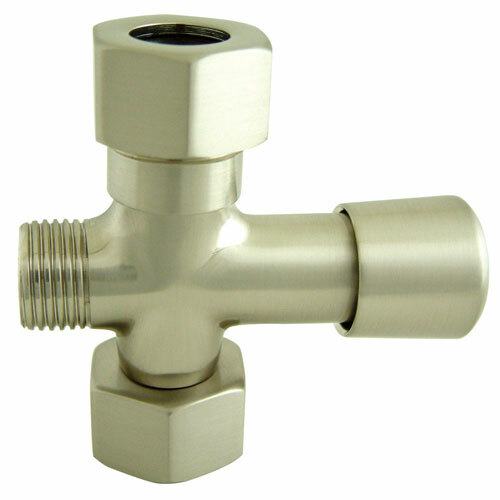 Satin Nickel Hand Shower Diverter Button - The solid brass flow diverter consists of two connecting holes, one to filter water through the hand shower and the other to the shower head. The lever provides transference of water switching from one valve to the next. The diverter is built in strong solid brass construction made for durability and reliability. - Constructed in high quality brass - 3/4" IPS Inlet - 3/4" IPS outlet - Satin Nickel premier finish designed to resist fading and tarnishing. - Beautiful premier finish - Designed for a lifetime of exceptional performance Matching Accessories Available - Easy to Install - Installation instructions included. This fixture is manufactured by Kingston Brass and is part of their Classic collection.